Just created this the other day, hoping to be able to extend the reach of this blog. Once I get more updates in regards to our mission trip to Venezuela, as well as our journey into adoption we’ll probably add video and pictures there too. So come on, Click here to “Like” my page and join in on the fun! 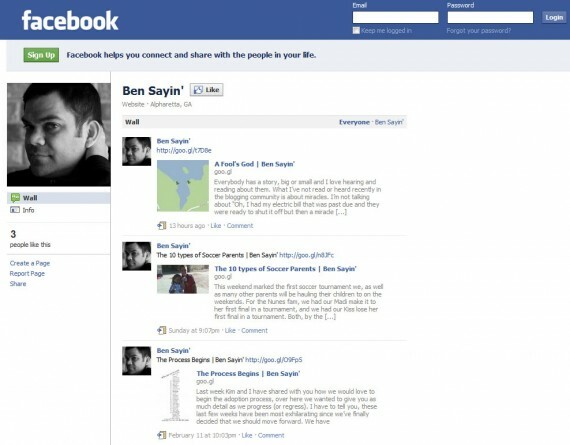 23 responses to Ben Sayin’s on Facebook! If I could have double liked I would have. “Double-liked” is what Elisha asked of Elijah’s when the two of them were discussing Elijah’s Facebook page. Sweetness, thanks Sean. I know I’ve already told you this, but thanks so much for writing your story. No problem! I stole your idea about the Facebook page BTW. Thanks for the idea. I was looking for a “love” button. I suppose like will be good enough for now. I guess we are not at that point in our relationship yet Ben? LOL. Guys. Get a room. Yeesh! Awesome, man. Just became a Like-er! Tony, still honored you shared your testimony the other day. Thanks again! Ok, I did, I do and I probably always will.